We've felt like spring in Virginia since, oh, February 1st. Despite the incredible temperatures, it was just last week that suddenly, happily, grilling season hit me hard. I'm not sure if it was the trees pushing open tiny buds of vivid green amongst blossoms in bright white and rosy pink, or the craving for rosé and sauvignon blanc in place of sultry red wines, or the backyard grass growing a foot overnight. Whatever the trigger, the need to add a smokey layer to the hyacinth-scented air is suddenly foremost on my mind. I am ready for charred burgers, and grilled pizzas, and sizzling bratwursts. 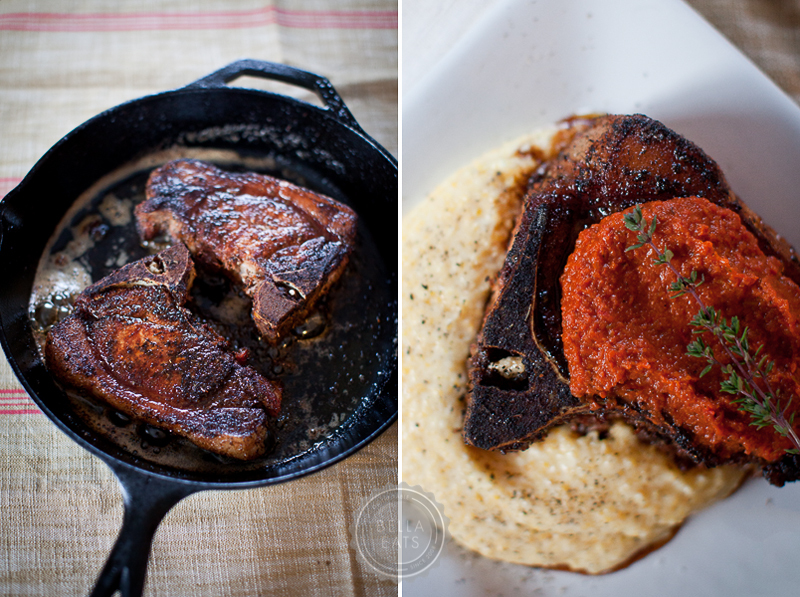 Or, these blackened porkchops with red gravy. They, too, would satisfy my cravings. These 'chops were prepared after a quick trip to Richmond in February, which always involves a stop at Belmont Butchery. Along with lamb bacon (a necessity, truly) and a beautiful pork shoulder, I brought home these cut-to-order, 1.5-inch thick, local porkchops for Brian. He was thrilled. The quickest way to my carniverous husband's heart is to present him with a lovely cut of pig. He immediately pulled out his favorite cookbooks, searching for a quick but worthy preparation. The Big Green Egg was fired up (another sure way to put a smile on B's face), the cast iron pan heated to 600°, and a shimmering pool of melted butter added. The sizzle and pop of meat followed and dinner was served just 15 minutes later. Oh, Spring. Welcome; please stay awhile, won't you? First, make the sauce. In a medium sauté pan over medium-high heat, melt the butter. Add the onion, bell pepper, celery, garlic, thyme, paprika, cayenne, and pepper. Stir occasionally until the vegetables are brown, 4-5 minutes. Add the red wine and cook until all the liquid is evaporated. Add the tomatoes and salt. Stir and simmer for about 5 minutes. Transfer to a food processor and purée. Return the mixture to the sauté pan and simmer until smooth. Set aside. Second, make the rub. In a small bowl combine the rub ingredients. Season the pork chops evenly with the rub and let stand at room temperature for 20-30 minutes before grilling. Start your grill, heating it to as hot as it will go. Add a large cast iron pan and let heat until white ash starts to form across the inside bottom of the pan. Pour in the melted butter and immediately add the chops, which will sizzle and pop and smoke. Close the lid of the grill and let the chops sear for about 3 minutes per side, then continue to cook until the juices run clear when the chops are sliced into, another 4-6 minutes. Warm the sauce over medium heat. 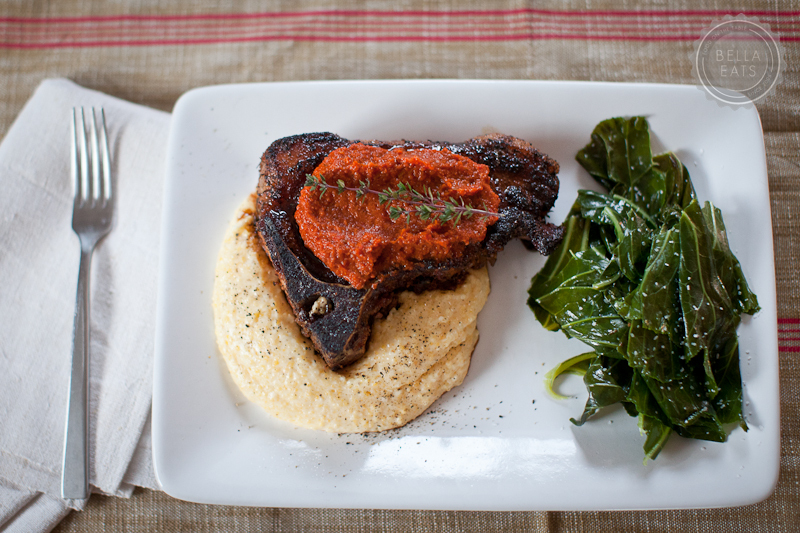 Serve the chops over a bed of polenta with a generous helping of sauce over top. In a large saucepan bring the water, cream, and butter to a boil. Add the salt to the liquid and whisk in the polenta, whisking constantly for the first 3-4 minutes to prevent clumps. Lower the heat and simmer for 45 minutes, partially covered and stirring every 10 minutes, until the polenta is thick, smooth, and creamy. Add additional cream or water if needed. Add the cheese and stir until melted and smooth. Salt and pepper to taste. Polenta should be served within 20 minutes of preparation. To reheat leftovers, add additional cream or water to a pan with polenta and stir over heat until creamy.